A soda tax was recently introduced in Berkeley, California. Now San Francisco may start requiring health warnings on advertisements for sugary drinks. A decision is expected soon. In Mexico, the world’s most obese nation, a soda tax was enacted last year and recent statistics already show significantly reduced soda sales. The soda tax works. Nothing is likely to impact the obesity epidemic more than employing all means to reduce soda consumption. Soda is probably a bigger risk to public health today than smoking. So if we can stomach legislation when it comes to cigarette sales we should welcome urgent regulation of the excesses of the soda industry. Personally I think a tax on sugar is a little too far. There could just as easily be a tax on butter, beef and eggs for "clogging arteries." Taxes on cigarettes have not really worked, a social change that viewed cigarette smoking as unhealthy and anti-social started the decline long before the elevated taxes came. Cigarettes just became an easy target for taxes. Lets focus on education instead before we release the angry villagers with the pitchforks. There are bigger beasts to slay in this epidemic. I am inclined to agree with Dr. Andreas, that "Nothing is likely to impact the obesity epidemic more than employing all means to reduce soda consumption." Warning labels on sodas and soda taxes are an effective means to implement social change and offset the misleading advertising propaganda from the beverage industry. The next major step will be to get the public to grasp that carbs, not fats, cause obesity, diabetes and heart disease. When that paradigm shift happens, healthy low-carb, high-fat foods will become more readily available, resulting in improved health for everyone who follows the LCHF lifestyle. I have greatly benefited from a low carb diet. I have lost 35 lbs and my sugar is constantly normal. However, I don't believe in the government mandating us not to eat any particular food. Here in the USA, we were founded on freedom, not tyranny from one powerful source, be it a King or a governmental entity. I believe true data should get out to the public, and they choose what they want. Period. Thank you Joanna and Kathy for your comments. I have much respect for Dr. A as his lecture on the AH2012 Symposium and his website introduced me to LCHF which restored my health. I lost 50 lbs in 4 months and I returned to my high school weight which I never thought possible after many failed diets with low fat and "heart healthy whole grains." I just disagree with him on this issue. Once I ditched grains and Omega 6 fats, and now eat real foods my tolerance to sugar dramatically improved. I don't feed my kids LCHF but they do get plenty of grass fed butter and cheese which they love. My kids used to be sugar maniacs and any small amount of sugar would send them into crazy mode and they would go to bed late and wake up grumpy and demand some sort of junk food for breakfast. After feeding them more butter and whole foods, sugar has the opposite effect, it puts them to sleep! And now when they wake up they demand cheese and berries instead of junk food for breakfast. My point being, once real foods like butter, whole milk, and eggs are back on the table, people will not want sugar so much. A tax on sugar will not help as long as our food supply is flooded with rancid vegetable oils and empty grains. I think the tax is a great thing - alternatively, we as the general populace are covering the massive costs of health care through our public health, much of which can be avoided if sugar consumption is reduced by whichever means. Taxes might make these products more out of reach and encourage people to return to water (from the tap!) to quench thirst. One step at a time - next can be grains and ill oils. Taxing "bad" foods to bias behavior is a serious mistake. What people need instead is valid information. As others have pointed out, anyone supporting such taxes is presuming that governments guess correctly. We've already seen efforts (like fat taxes) where they did not - not to mention alcohol, which is not harmful in modest amounts. If governments know enough to guess correctly, why don't they just share that advice with us. Taxing macro or micronutrients is taxing food. In many places, foods are exempt from taxes. In order to tax "bad" foods, this exemption must be eliminated. Watch out. Taxing food is also no real deterrent. The taxes on alcohol slow down no alcoholics. Taxes on tobacco are likewise ineffective. I know of no one who adjusts the consumption of either, much less abstains, due to taxes. These addicts merely end up with less money to spend on other things, like actually healthy food. Such taxes amount to government exploitation of addiction. Speaking of addiction, the collected funds get spent, usually on some wasteful agency that, once attached to the public teat, does not want to lose that funding. If the "bad" food tax "works", and consumption declines, government spending rarely declines to match. Instead, they decide that tax rates need to be raised, or new scapegoats need to be taxed. Or in some egalitarian distopia coming soon, the healthy need to be taxed to provide "healthcare" for the unhealthy eaters, who are unhealthy merely due to the choices they make. Be careful of what you wish for, for you may get it, good and hard. We need information, and not nanny state meddling. And right now, the most useful information is coming from dissenting diet sites like this one, and not from nest feathering bureaucrats. We are only having this discussion in the first place because of government intervention in diet (McGovern Committee leading to USDA mandate). Are we really going to trust the fix to the people who caused the problem (and have yet to apologize for that)? Finally, with that topic image in mind, the state of California has particularly low credibility due to crying wolf on anything that might possibly be colorable as carcinogenic. 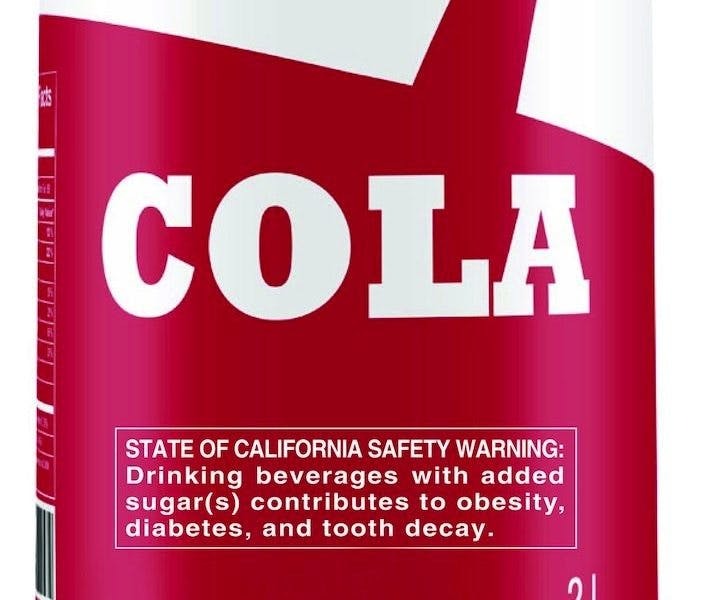 People are going to treat that sugar warning panel with the same respect as the ubiquitous "known to the State of California to cause cancer" labels - i.e. their eyes will glaze over as they chug the jug. On the other, a sugar tax on soda would push me over the edge. I am addicted to Coca Cola. Every now and then I swear off all soda... and then eventually start imbibing again to my detriment. If they imposed a sugar tax on soda, I know it would motivate me enough to stop entirely. As it is, I have gone for a month or two without buying Coke when the grocery stores have the audacity to charge $4 per 12 pack. Screw that! Someone mentioned the possibility of the government charging taxes on Butter, Beef, and eggs, for 'clogging arteries.' We all know (well most of us I hope) that a diet rich in butter, beef and eggs not only won't clog arteries but will help clear them and reduce our waistlines. I do NOT want to trust the government to decide what is healthy for ME to eat. They'll promote sugar, and take away our healthy proteins and fats. You can count on them doing the worst thing.
" If they imposed a sugar tax on soda, I know it would motivate me enough to stop entirely." every time you drink a can.